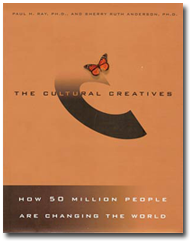 I had the pleasure of meeting psychologist Sherry Anderson a decade ago as she was completing the manuscript for the her groundbreaking work, The Cultural Creatives. In my blog on Monday, I touched on the idea of sacred service. The Cultural Creatives is another commentary on a more hopeful future, and prepares us all for a transition to a new, saner, and wiser culture.